AS THE years passed, the intensity continues. And for every tournament conference, teams are getting better and made the games highly competitive. This is all about the inspiring story of Pinoy Basketball of Qatar or simply PIBAQ, already a by-word among Filipino basketball enthusiasts in Qatar. In the last six years of its existence, action at the PIBAQ games continued to heat up into the higher level of energy. Every team that would join the fray has only one thing in mind: To go for the elite semi-finalists round and keep their fingers crossed that they would get a crack to the coveted championship round. 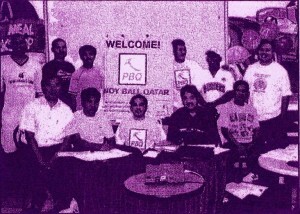 It all started with a strong desire among a group of Filipino basketball enthusiasts to establish a league that will truly promote sportsmanship, unity and camaraderie to a growing number of Filipino expatriates in Qatar. Die-hard basketball fanatics as they are, the group felt the urgent need to build the league to make it entirely different with a common goal in mind: It would not just be a tournament to suffice many others crave for the love of such sports, but a league, like no other, that would truly open wide opportunities to those who have basketball talent and skills here and back home. The red-letter day came. It was one fine fateful day of November 17, 2005. The groups led by PAT Carido & Bombet Vitor were raring to go and agreed to formally establish the league. They broached the idea of naming the league as PIBAQ. They made a bigger commitment among themselves that they will hold a tournament not for just regular sporting event sake, but to generate funds to help other countrymen who are in dire need even in small ways as they can. Since there was no turning back for everyone, finally PIBAQ was born. Officials of Qatar Basketball Federation (QBF) were glad and in fact were impressed. It did not take long enough for QBF Assistant General Manager Rashid Al Abdulla to recognize PIBAQ under their wings. Under QBF’s tutelage, PIBAQ sets new ground rules and by-laws for its future tournaments to provide the Filipino community especially basketball enthusiasts a more exciting and a brand new basketball games in Qatar. PIBAQ also supported the Philippine Team for the Al Emadi International Basketball Friendship Game, Interclub’s Friendship Game. PIBAQ also conducted basketball clinic for young boys aged 16-years old below regardless of nationality, by a professional and qualified trainers from the Philippines who has attained highest tournament league in the Philippines. The Second Conference was held on October 10, 2006 until April 4, 2007 followed by a Friendship Game of GMA 7 Pinoy TV-All Star Basketball Exhibition on April 27, 2007. Part of the proceeds from the 2nd Conference Vigor Power Energy Drink Championship Cup was given to a distressed OFW seeking refuge at the Philippine Embassy Doha. The outpouring of support kept coming in not only from the Filipino basketball patrons but from other communities in Qatar as well. PIBAQ’s sincerity to be of help to everyone in Qatar was truly a blessing. The support during the 3rd Al Emadi Enterprises Basketball Championship Cup came aplenty that PIBAQ organized another charity effort. As the conference concluded on January 11, 2008, PIBAQ officials handed over the donation to Qatar Society Rehabilitation & Special Needs & Asia’s Rehabilitation aside from free plane tickets to Manila awarded to two lucky Filipino expatriates. “It was once again shown that Filipino charity is everywhere in the globe and always willing to lend a helping hand to the less fortunate in the society regardless of nationality, color and race.” said PIBAQ President Pat Carido.